How could Skype be used within an educational or learning situation? How does it work? What does one have to do to start using Skype? How is it related to other applications (that is, can it be used in conjunction with other applications)? What are some examples (e.g., web sites) of it being used to illustrate its current educational value or potential value? What are some unique ways of using Skype? What is the Purpose of Skype? What is the title of the application? Who developed Skype? What Are the Uses of Skype? What Does It Do? The main purpose of Skype is to connect people. People from around the world can connect through many different ways. They can connect through one or two way audio, one or two way video, one or two way audio and video or through text. People can also call any telephone around the world though this costs money, but talking between Skype users does not cost a thing. It can be used on Windows, Mac, and Linux operating systems so almost all computers are compatible. It also works with many different cell phones and mobile devices so individuals can use it whenever/wherever they want. It also can be used by a teacher who is teaching an online class. Skype is used for businesses that need to reach people around the country or world for as cheap as possible. When business workers use Skype they can get more done, talk more to your clients, and cut your phone bill. Business workers can make free calls to people when they are using Skype and if they choose to call mobile phones or landlines it is very cheap.They can also use Skype from many mobile phones so you can use it anywhere. Skype also allows users to make video calls so business workers can make conference calls for free anytime, anywhere. Skype is great for all teachers. A teacher could utilize Skype in instances of distance learning or cultural / language learning. For instance, a teacher could teach students geographically separated by lecturing through Skype on the computer while the students sit in their homes anywhere in the world. Calls concerning questions about the lecture would be free of charge between Skype users. Another example might include a Spanish teacher who has their students interface with students from a Spanish speaking country in order to explore and learn about culture and language, benefiting students of both parties. Since Skype is available in 28 different languages, students can use it to communicate with other students across the world to learn their language and culture. Skype can be used for a variety of different way but one of the most popular ways people use this program for their own personal use. People are now able to talk to family who live halfway around the world or friends that live down the street. Since Skype is a free service between Skype users, it is much more cost efficient than calling loved ones over the phone. Millions of people daily are using Skype to keep in touch with their loved ones. Different people use Skype for various different reasons but lately more and more people are using this program is to communicate with loved ones that are far way. One example of this is when people who serve in the military all around the world can talk to their family back at home. Through Skype, people in the military can see their family who they haven’t seen in several months. Since Skype is a free service between Skype users, it doesn’t cost the people skyping any money. This is a great feature and some people are even getting married via Skype. Skype was founded in 2003 by two entrepreneurs Niklas Zennström and Janus Friis. The two founders worked with a team of Estonian programmers to create Skype. Skype is a free software that allows users to make calls over the internet. This was not the first collaboration of the three programmers and founders. They previously had developed the program Kazaa in 2001. Kazaa is a peer to peer media sharing device that now allows users to download songs and ringtones. Skype was launched with high expectations; Janus Friis hoped "that one day instead of saying 'I'll call you,' people will say 'I'll Skype you.'" It was launched with the intention of being the telecoms company of the future. Originally the name for this project was “Sky peer-to peer” which became abbreviated to “Skyper”. However there were problems with common domain names, so it was decided to drop the “r” giving us the current name of “Skype”. Skype Limited is the operator of this network and is partly owned by eBay. These headquarters are located in Luxembourg, while the majority of the development team can be found in Tallinn, Estonia. Skype also is currently available in 28 different languages and is used in almost every country. This allows many different cultures to get together and allows several different people to communicate across the world. Skype has won many awards, it's most recent being the CNET Webware 100 Awards on June 19, 2007. Niklas Zennström was recognized by TIME magazine as one of the most influential people. He and Janus Friis have won many awards on behalf of Skype. Start: To begin using Skype one must go to http://www.skype.com/download/skype/windows/downloading/ to download program onto computer. Downloading Skype is free and there is no start up costs involved to install it onto a computer. Devices needed in order to use Skype: To use Skype you need to have a PC which is a Windows 2000, Windows 7, XP, or Vista. Furthermore you will require a microphone or Skype phone in order to communicate to another party and will also require a webcam if you wish to make Skype video calls. How to download Skype: On the given web address link this screen below will appear and leads the user through a simple 3 step process to download it. A.) How to make phone and mobile calls with skype Check to see if the user you want to call is already a skype user, because calling between skype users is free. If not, you will need to have sufficient Skype credit before making the call to non-skype people. Skype to skype calls: Simply add contact if they are not already on your contact page. Click on the person you want to call and click the green phone button. The recipient of your call cannot be on invisible or offline. Skype credit: With Skype credit you can use Skype's great pay-to-use products like voicemail and text messaging feature, plus use for calling phones and cells. Create an account or sign into your current account and from there you can check your existing balance or buy more Skype Credit. Credit remains active for 180 days after your last use of a product or feature that uses credit. So making a single call, or sending a single text message will ensure your Skype Credit is active for a further 180 days.Skype Credit works on Windows, Mac OS X, Linux, Windows Mobile, WiFi phones, Cordless phones, Nokia Internet Tablet. B.) How to make free video calls to other Skype usersTo make free video calls you'll need the latest version of Skype and a webcam and headset (if you don't have a headset you can use the in-built speakers and microphone on your computer). Connection: Since Skype runs off of your local internet connection, make sure your connection is strong. Just click on "Check settings" to see what component is causing problems. If your connection is weak, your video chat or text chat will not work properly. If you have this problem close other programs that are using the internet connection as well. By clicking and calling the "Echo/Sound Test Service" you are able to check how well the microphone, speakers, and connection is running. Profile: Skype, just like many other programs, has the option of personalizing your profile. You may update your current residence, profile picture, birthday, and phone number. Along with this you are able to update a status to let your friends know what you are doing at that time. Others: Skype lets you do a variety of things such as play games, view your conversation history, search for friends, and change views to make you feel more comfortable. There are also many free applications offered once you set up Skype. Just click on the Tools tab, the put your cursor over 'Do More.' A tab will open with a list of popular features, or you can select the 'Get Extras' option from the menu. A box like the one shown below will open. From this point, you are able to browse through any of the Extras that you'd like. They range from business oriented to educational enhancement features. You can do something as silly as creating your own Skype Avatar or as serious as sharing a white board with your business team to improve a conference call. Whatever your need, there is most likely an application to meet it. The possibilities of Skype are endless. Some organizations, businesses, and colleges have found interesting ways to use Skype. Ed Gallagher, a blind man, was featured on the Today Show (September 29, 2008) for his innovative use of Skype technology. Blind Ambition (video) shows how Ed uses Skype to go bike riding, ski, shop, and even sail. Ed uses a webcam mounted on his forehead through which his Skype navigator can see. He reacts to number of paces and degrees [to turn] as told by his Skype guide. Ohio University has a Skype based reference system at a kiosk in the Athens library. Students and patrons alike are able to call in questions when they are not on campus. It is important to realize that this system could be possible in any educational settings, especially in districts that are short staffed on librarians. The process is much faster and more efficient then replying to hundreds of emails. Another handy Skype feature is the "send money" option. This makes it easy for you to pay your employees, spot your daughter some cash, or pay a person for their products and services. The feature is associated with Pay Pal, and allows you to make a direct transfer with only the Skype information. In today's world technology plays a significant part in everyone's lives. Thanks to technology, education can reach new heights and expand the learning experience of each student. With the use of Skype students can explore their world on a more realistic level than ever before. One day they could discuss the rainforest with a botanist in Ecuador and the next learn about poetry from a writer in Great Britain. Imagine your students learning about the Chinese culture by a child their age that lives in China (check out the lesson plan below) or even learning about becoming a brain surgeon by talking to one that works three states away (check out the lesson plan below). The possibilities are endless with Skype! Overview: Over the course of a week, students will get to meet individuals of different cultures around the world and learn more about these cultures through discussion. To teach students about the different regions and cultures around the world. To teach students about diversity. Overview: Students will write a research paper that will include an interview about what they want to be when they grow up. Students will gain a better understanding of how to write a research paper. Students will learn how to properly conduct an interview. Students will have an understanding of how to use technology and video chat. If your child is having problems in the classroom Skype has made it easier to get them the help they need! This lesson plan explains everything you need to know about how to go about getting your child help in a much more convenient way. No need to travel anywhere or go out of your way. Tutoring through Skype is efficient and very effective. Unless you are a proffesional Irish Step Dancer, you probably can't teacher your students how to do this famous dance. Thats where Skype come in. This lesson plan allows the teacher to use the program called Skype to have a video conference with Irish Step Dancers in Ireland. Students wiill also learn information about the country of Ireland and the culture there. Learning about different cultures is very educational, but is most often done through book work. With the use of this application, students can get a first hand experience with those cultures. This activity will link students around the world and give them the opportunity to ask questions that interest them. Thanks to technology, people's knowledge all over the world has expanded. Teachers are now able to incorporate a great number of things into their lesson plans that they may not have been able to before. With the use of Skype, teachers may be able to reach a whole new level of knowledge. Can you imagine; instantly you could be text chatting with a famous author who is living in Europe for a paper that the students are working on. Or you could be on the other end of a video call to a famous archeologist who is working on his next project in Africa for a history project. Students will be able to text chat with an author who is residing in Europe for a paper. Students will gain background on the author as well as his work, with first hand information to help them develop their papers. Students will be able to video chat with an archeologist residing in Africa for a history project. Students will gain information on the archeologist, as well as the history of the work he is currently working on. Overview: Students will conduct a tutoring session with each other using the web cam features. Marquette University in Milwaukee, has found an effective way to marry Skype with their Italian and Spanish foreign language programs. Students in both programs use Skype to practice their Italian or Spanish with a native speaker. These "language partners" take turns speaking the languages they are learning for 25 minutes each. Colleen Coffey, a Spanish teacher at Marquette, said, "This is revolutionizing our language teaching." Penn and Dickinson College both plan to add Skype to their Japanese, German, and Spanish classes. The University of Tennessee already uses it in it's French and German courses, but plans to expand it to other foreign language courses. Students will better understand common phrases, pronunciation, and culture of the language being studied. Students will be more comfortable speaking the language. A Grove City College professor, Joseph Pisano, has found an interesting way to use Skype in his classroom. He is a music professor and conductor at the college, and firmly believes in using Skype to enhance learning. He uses it to invite experts in the music industry to speak to his students. He teamed up with Travis Weller, director of band grades 7-12 at Mercer Area Middle School and High School, to use Skype during a live performance. Weller directed the students live while three composers answered questions and comments from the audience about the performance. 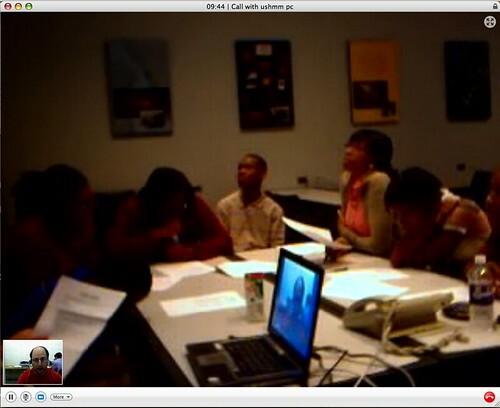 During their International Week, students at Ohio University experienced just how helpful Skype can be. The director of the Al-Khatim Adlan Centre for Enlightenment and Human Development in Sudan, Albaqir Mukhtar, spoke and lead a discussion on the crisis in Darfur. Mukhtar used his laptop with a built in video camera and Skype to interact with the students. Swarthmore College in Swarthmore, Pennsylvania is also making new strides with Skype. Students there felt that the media was only presenting a select few stories to report of the daily happenings in both Iraq and Afghanistan. The students used Skype to locate locals of both countries to interview them on their experiences with the war in their country. One of the students, Hansi Lo Wang (senior producer of War News Radio), said, "My most memorable interview was when I heard gunfire going off in the background." It is obvious that students can gain important insight through experiences such as these. Objective: Students will be able to write an article on their finding of the ongoing conflict in Iraq or Afghanistan based on a native's personal experiences. Overview: Students and student teachers will be introduced to the basics of the Web 2.0 utility known as Skype, designed as an easy and cheap method to communicate through the Internet. Students will be expected to work in pairs. Objectives: Following the perusal of the Skype wiki, a pair of students will successfully demonstrate their knowledge of the Skype utility by downloading the program to their computer, creating a Skype account and executing three different types of communication with their partner through Skype only. Make your money work harder. Using Skype, you'll find that you are actually getting your money's worth. All Skype to Skype calls are free, so it would be to your advantage to encourage your customers to use Skype. If that isn't possible, Skype offers affordable rates on all calls made to landlines or cell phones. Skype also has an application in which you can manage the Skype credit of all your employees. By using Business Control Panel, you can alter the settings to automatically transfer more Skype credit into an employees account when it drops below a certain number. It's also easy to print off expenditure reports to keep a close watch on budgeting. Skype has alot of features and extras to help you run a smarter office. For example, through chat you are able to transfer any files or send a fax to an associate, client, or boss. Chats can also be saved so if there is confusion later, there is an actual text for an employee to refer to. There is also the option of using video call to interact with others. Skype also has an extra that allows you to record video calls that way they can be referred to at a later time. Video conference calls are an efficient way to talk with others while saving money on transportation costs. Skype allows you to build a more personal relationship with your clients by dealing with them face to face even though they are miles away. Skype also offers toolbars to incorporate Skype into programs that you use everyday, such as MS Outlook and MS Office. With Skype, it doesn't matter where you are, you can still do business. With Skype mobile, employees can go anywhere and still access Skype. WiFi compatible phones, special Skypephones, or even phones with Windows Mobile can connect to Skype. If your employees don't have any of these devices, Skype to Go is always a reliable option. By subscribing to Skype to Go, you will be given a special access number that allows you to make calls from any phone (land or mobile) Your company also has the option to set up monthly subscriptions for unlimited calls to landlines anytime by region, country, or worldwide. Unable to render embedded object: File (skypetogo.png) not found. To learn more about what Skype as a company aims to accomplish in the business environment, watch this video. Teachers, like Travis Weller, are using Skype to invite guest speakers into their classroom. This is an effective and cost efficient way for schools to provide an enhanced learning experience for their students. He invited three accomplished composers to speak to his students. Since the speakers all had Skype, this cost him nothing. They were also able to do a video session, in which the guest speaker was projected from an LCD projector. Mr. Crosby of Agnes Risley Elementary School in Sparks, Nevada, learned that he had a new fourth grade students who had leukemia and couldn't come to school because of treatment Instead of abandoning that student in her time of need, he thought of an interesting way to teach her without having her leave her home.Mr. Crosby uses Skype to teach Celeste from her home. While this is an exceptionally inspiring story, it shows how useful Skype can be in the classroom. This little girl now has the opportunity to attend class without actually being present in the school. Click here to watch the video on Mr. Crosby's class. Skype is a great tool for students that need extra help for understanding material that was taught in the classroom. This program can allow teachers to give their students extra help without them being in the classroom. Aside from being a useful tool for teachers, private tutors may also find this tool useful in teaching their students. One way that Skype can be useful is if a student is out of town and can’t be able to meet with their tutor. The tutor or instructor can help the student understand material by using Skype. "It's a small world after all..." A commonly known song is brought to focus as Skype connects nations and eliminates certain distance boundaries. Skype can effortlessly and FREELY connect a citizen of one country to a citizen of another and they both can hold a conversation as if they were right next to each other. It surpasses using the telephone because it is free and there is the possiblity of using a webcam to include nonverbal communications including facial expressions and body language. What does this mean? So many things can be made possible through this type of free international communication. It can go beyond conversation and expand to business meetings, interviews, public or private services and much much more. Lisa Herb, the founder of the Alliance for International Women's Rights, has found a creative way to use Skype. After spending some time in Central Asia, she formulated a plan that would allow women of this region to learn English to improve their lives. Through the Armchair Development Program, Central Asain women work with ESL instructors via Skype. Lisa Herb said this of the women, "They need to speak English to reach out to the international community for funding, for research, for information about what women in other countries are doing about similar problems, for example domestic violence, what legislation exists in other countries. All of that is done in English." A man by the name of Jason Phelps from Montreal offers his services as a Psychotherapist internationally by using Skype. On his website he encourages the downloading of Skype as a free method of communication. He has a link on his website that allows owners of Skype to instantly contact him. It is amazing what can be accomplished with technology. As a result of the convenience provided by Skype he has expanded his possible clietele list and can more widely distribute his services. It can be inferred from this that other businesses can be expected to use technologies such as Skype to further their business progression. Many companies are using Skype as a way to communicate with international clients. Many CEO’s, presidents of sales and managers of big companies are falling in love with the capabilities and features that Skype has to offer. An example who is an avid user of Skype is Jeff Craig. Craig is the vice president of sales for a company in Chicago, IL called BridgePort Networks Inc. This company deals with developing new technology for cell phones. Craig uses Skype as a way to have conference calls with foreign clients and he has found this method to be much more cost efficient then actual phone calling. "We did it as a way to reduce our costs that we incurred for conference calls," Craig said. Many other companies are using Skype in this way and are finding it very helpful for their business. In 2007, users in China attempting to download were redirected to a site of TOM, where a modified Chinese version can be downloaded. The chief executive of Skype, Niklas Zennstrom, reported that TOM “had implemented a text filter, which is what everyone else in that market is doing. Those are regulations.” “One thing that’s certain is that those are in no way jeopardizing the privacy or the security of any of the users.” Then in 2008, it was found that TOM had actually been saving contents from text conversations on its servers, and a server misconfiguration made these files accessible to the public. Customer Service has also had its fair share of complaints. Aside from indirect assistance through web portals and select email addresses, there isn’t a phone number for complaints. It is also unclear on the country that would hold jurisdiction if there would be need for conflict resolution. Spark, David. "Companies Embracing Skype?With Reservations - VOIP and Telephony - News & Reviews - eWeek.com." Technology News, Tech Product Reviews, Research and Enterprise Analysis - News & Reviews - eWeek.com. - Review the goals of Project II that was presented in lecture on Monday. Think about this project and come up with some of your own ideas. Make sure you share those with the rest of the team members. - Remember to keep Dec. 4th free because that is when we are presenting our final project. - We will post our discussions and wiki text on here (Confluence). If you have problems you can go through the tutorial that Dr. Newby posted on Blackboard. There is also a great resource in Hicks Library. Go to the 2nd Basement level and go to the Digital Learning Lab. Kevin O'Shea (Purdue's Confluence expert) will be there with others who have offered to help us in anyway they can. - From Blackboard go to the Lecture section. Under week 10, find the Confluence Online Discussion Assignments. You will post your research and findings under the RESEARCH page that I created on here. That is all I have for right now. Please let me know if you have any questions. If I don't have the answer, I will talk to Ayesha about it. I think we need to meet ASAP as a group to discuss our intial thoughts and ideas about this project. We also need to figure out everyone's roles and responsibilities. If you could just please post your name, email address, and just your initial thoughts about this project. Also, please post when you are available to meet. One last thing, don't be afraid to post any ideas or thoughts that you have. This is a team effort and lets make it a good one!! Hey Everyone!!!! I'm Cara and I'm an Agricultural Education major. Um, I've never really worked with Skype before, so this is all new to me! I'm excited to learn how to use it My strengths for this project would probably be in researching or in evaluating. My email address is chummel@purdue.edu. My schedule is pretty open in the evenings, although next Thursday I have 2 exams, so Wednesday may be out for me. Hope you all have a great weekend!!!! Hi, I'm Cat and I'm an Engineering/Technology education major.I've used skype to make many phone calls before across the country and overseas. I think that we should meet on Sundays otherwise I probably won't be able to make it since I have a full time job along with 16 credit hours and am in 3 students organizations. Also, we should probably see about reserving a lab since we have a large group. I hope to get to know you guys and I look forward to getting an A on this project.If you guys can, I think we should add pictures to our profiles so it will be easier to recognize each other. Hey everyone, my name is MerrieBeth and I am a math education major. I have never used skype before, but my good friend uses it so i will talk to her. I think I can do any part of the project. I can research though. I am not the greatest with technology sometimes, but I am getting and A in the class, but sometimes I hate the computer. I think Sundays will work the best for me because I have things all throughout the week and games still on Saturday. I really want an A on this project for my gpa and so we don't have to take the final. I am ready to work so let's do it! ps I won't be in lab this Friday because the band travels to Michigan State and the twirlers go too, so I will be there. Also, we talked about that presentation rehearsal before Thanksgiving break that we were all in shock about, but I had something gofing on at home and I bought my ticket home for Monday night, so I was wondering if we figured out if we all have to be there? Hi everyone, my name is Wen Lim and I am in Elementary Ed. I'm from Australia and on study abroad here for this fall semester. I use skype alot here to talk to my family and friends back home! We actually got a really good topic cause there is tonnes of creative things we can do with it. Anyway I would be interested in doing research or evaluating as I use it quite a bit and am pretty familar with it. I'm free pretty much all nights and Wednesday day before 3pm. Hi everyone! My name is Christy Klink, and I am sorry it took me so long to do this!! I am in Elementary Education. I've used skype some, but just recently. I've talked to my roomate a few times and I downloaded it because I wanted to talk to my friend who is studying abroad in germany. I actually have not been able to talk to him, but all other experiences on skype have been cool! Anyways, again....sorry this introduction is late, but I'm up for anything in the project! Hi Everyone! My Name Is Richa Thakkar. I'm a Secondary English Education major. I've never used skype before, and i don't really know much about it, but i have heard of it. I'm really up for anything and i'm willing to meet anytime after 430 pm because thats when my latest classes end. I really want to get an A on this project so let me know what i can do to help! Hey guys. Lets start adding things to the children pages at the top. Lets add as much as we can to research, purpose of skype, and the other ones. We will be assigning team roles at the meeting tonight. Hello everyone! My name is Teresa and I have never used skype before. I am up for working on any aspect of this project and I really want that A! My strengths are creativity like artsy stuff or generating original ideas, I love to do things like presenting (my other major is Acting) and I'm pretty comfortable with talking to and infront of groups of people and memorizing information. Hi everyone! My name is Morgan and I am CODOing into Elementary Education. I personally have never used Skype before, but my roommate last year used it ALL the time. I am pretty much up for anything when it comes to the project, just know whatever task I am assigned I will give 110%. Not only do I want to get an A and not take the final, I want us to impress all who are at the presentation. I can't usually meet on Mondays or Tuesdays. I can only meet on Wednesday before 8 pm. I am involved with a lot and I work so I will do my best to work around my schedule to accomodate all of you. Well see you all tonight! Hello all! My name is Ashley and I'm currently CODOing into English Education. I don't really have any personal experiece with Skype, but my roommate used it all last year. I don't really mind exactly what my task will be in this project, all that matters is that we all work hard enough to get that A. I can pretty much meet any day of the week, but this weekend I will not be able to since I will be out of town. Other then that, let's get that A! So we met tonight and there were only three of us there. Everyone needs to take responsibility and let me know if they can't make it. A couple of you guys did and I appreciate that. Well we discussed the roles and responsibilities and here is what we came up with. - - Lesson plans: We are going to write 3 lesson plans and one bussiness application, so we need someone who is going to write on. If you are elementary education, maybe you could choose this one. - -Presenters: I would like everyone to do this, so just tell me if you have a big fear of presenting. We are going to be presenting for 3-hours in a job fair like setting, so we will rotate in shifts so that you don't have to work for three hours. You have a 2-3 minute speech you tell people when they come to our table, then we will answer any questions that they have. - -Presentation team: This group of people will work on everything in the presentation. I am planning on doing a little bit of everything. I am sure more roles will be added as we go along. Once we get all the information for each section we can make it look good and organize it more. Everyone needs to be checking Confluence at least three times throughout the day to remain accountable. If you don't feel comfortable with your assigned role then we will discuss it in lab. For this week we need to add material to our sections and start making our outline. We can discuss our ideas more during lab on Friday. Please check your email multiple times throughout the day as well. Hey sorry i'm late writing on this but better late then never. My name is Michael and im in social studies education. I actually use skype a lot to video chat with people so i know that basics of it. you can email me at Mchacksf@purdue.edu or call at 513-535-2593. Hey I am Kalan Sebert and I am currently in a Fine Arts major focusing in Jewelry, but I am switching into Elementary Education. I have always wanted to use skype so I am very excited about our project! YAY lets do an awesome job!!! Hey Skype group. My name is Taylor from the TeacherTube group. I think your guys' organization and page layout is awesome and you have so much information, it's amazing. You all seem to be on the ball with this project and totally on track. I think Skype is an amazing form of communication, especially with long distance. You guys are doing an awesome job. Keep up the good work and good luck! Hey i heard from someone else taking this class that we only have to pick one section >> like elementary, secondary, or business.....and only focus on that one topic. is that true? We have to do every section. Ashley are you coming? I like the way you are setting the sections up. Could you let us know how you do it possibly? I feel bad that you are doing all the work with organizing and stuff. Here are a few sites I have found. This one is about free software called Pamela. It can be used to record skype conversations. I know we talked about possibly doing this for our presentation. This one is about using skype in school libraries. Also, I found out that Skype does not have to be on your computer to use it. It can be downloaded to a USB drive and the computer can run it from there. That would be useful if you are traveling and can't take a laptop with you or if something happens to you labtop, you can use any computer with a USB port. Oh, and one more thing. You CAN copy and paste in confluence. Instead of using the mouse use the control keys. Hey guys, ok so I'm working on switching everything back to text. Don't worry, I won't make anyone help me. Ha no, it really isn't going to take me that long. But switching it back over, it really shows a lack of information, so PLEASE PLEASE PLEASE research some more. I know it's a pain but we really need more info, esp compared to other groups. I know some of the pages don't look that good, but thats because I'm still working on them. I'll let you all know when I'm finished! Hey everyone, I'm almost done editing everything. Take a look around, if you have more info for a section, please put it in a comment. Also, Elementary and Secondary Lesson Plan girls, I need you guys to do your own formating since I don't have your original files. If you would like to just copy and paste the text in there, that will work. I will go back and format it so it looks fluid with the entire presentation. Thanks everyone! Skype is easy to navigate, and it only took me five minutes to make an account. Although the application can run slow sometimes, it is to be expected. Skype is a great way to enhance learning, because many college professors teach through Skype. Also, the application can be used to connect all levels of students with other students around the world. For example, a foreign language class could go to the computer lab and use the audio or video connections to communicate with foreign students and practice the language they are learning. In addition, they could use the chat capabilities to discuss different cultural experiences. Also, students may connect with a scientist or professor in another part of the world to learn more about a topic they are discussing in class. I would give Skype 4/5 stars, simply because the technology can run a little slow sometimes. I have never used Skype before (I usually use Google Video Chat) but I thought it was a really good application. Skype was very simple to set up. I had a little trouble with my test call but I got it to work after a few tries. I think that Skype would be a really useful tool to use in the classroom. Students could chat with each other about topics we discussed in class or they could collaborate on group projects without needing to physically meet outside of class. The lesson plans given on this site to use with Skype were really interesting. I particularly liked the idea that students could skype with kids from other places around the country or the world. Skype could be an interesting way for students to learn about other places without ever leaving the classroom. I would give Skype 5 out of 5 stars because it is very easy to use and because there are so many different ways it could be integrated into a lesson plan. Skype is an excellent application that can be used in many different ways. Not only is it free to download, but it’s also very simple to use. Everything in the application is self-explanatory, so it is very fast and easy to use if you want to quickly video chat or just phone chat with someone. Personally, I think Skype is a great application to chat with family and friends without wasting cellphone minutes. Also, Skype allows that face-to-face interaction even if you and the other person are far apart. My sister lives in New York for college and I am in Indiana for college; we are always using Skype just to catch up with each other. It’s a great tool that is available to everyone. I think Skype is a very innovative tool that can be incorporated in educational, business, and personal settings. Most importantly, it can be used in an educational setting by giving the teacher the ability to communicate with students easily. It allows the teacher to be available to his or her students whenever the students are in need. In traditional classroom settings, the teacher is usually only available via email or through class time. Why not change that? We are in a new generation with so many uses of technology and we should take advantage of that. Incorporating Skype within education, students would be able to contact their teachers with Skype, asking whatever questions they need whether it is just through type chat, video chat, or a phone chat. Moreover, everything on Skype is free and downloading it is simple. This makes Skype a convenient tool for teachers and students. Student would be able to ask for missed homework and classwork assignments if they were absent from class. Teachers would be able to form online chat rooms for online at home discussions to make the learning experience more of a variety. There are limitless ways to use Skype in the educational environment.